Wild goats (Hebrew ya’el) are mentioned in a few Old Testament passages (1 Samuel 24:2; Job 39:1; Psalm 104:18; Prov. 5:19). This animal is often identified with the Ibex. The ibex, a type of wild goat, is still found in Southern Palestine, Sinai, Egypt and Arabia; it was known also in ancient times, as is evident from rock carvings. (Fauna and Flora of the Bible, 46). 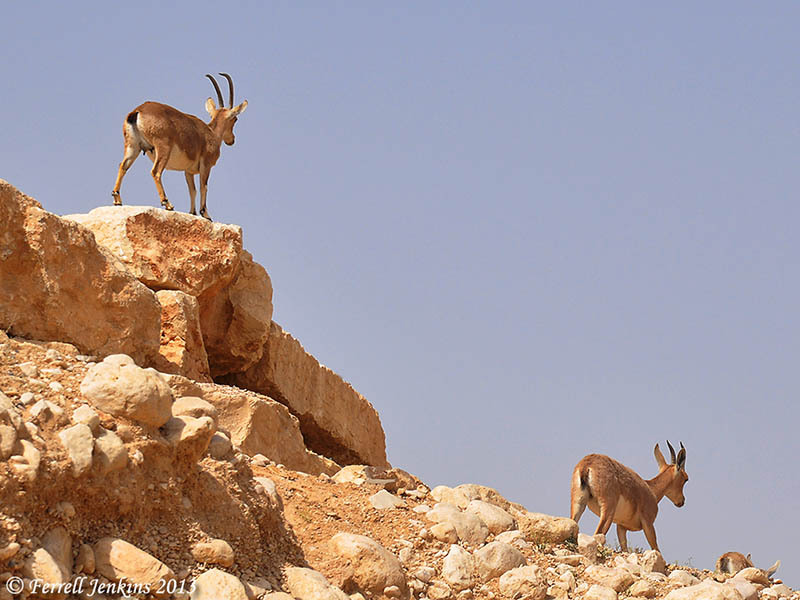 The wild goats are associated with En Gedi on the shore of the Dead Sea. Young Ibex on the run at En Avdat. Photo by Ferrell Jenkins. 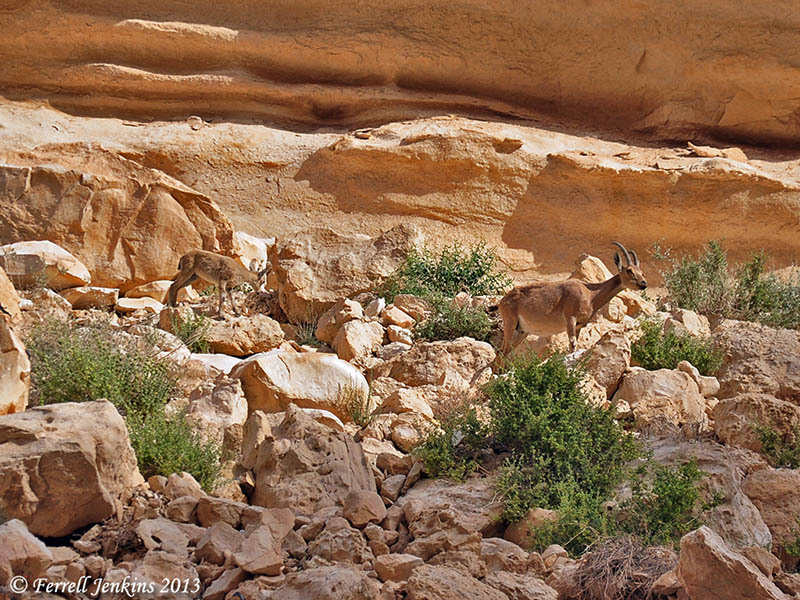 The next photo illustrates how well the Ibex blend in with the terrain in which they live. Ibex at En Avdat in the Wilderness of Zin. Photo by Ferrell Jenkins. The last photo shows the sure-footed Ibex seeking out the high places. Ibex in the wilderness of Zin near En Avdat. Photo by Ferrell Jenkins. The reference to the hind or deer (Hebrew ayyalah) in Psalm 18:33 (Hebrew 18:34) indicates a different species, but the analogy is the same. Both Hebrew terms are used in Job 39;1. 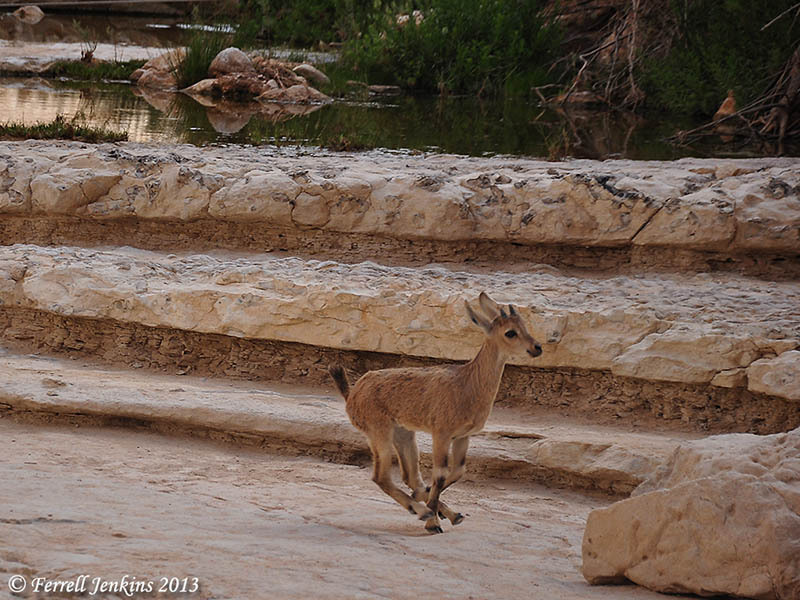 If you would like to see another photo of the Ibex at En Gedi, click here. Personal Note: A few friends who have missed the blog have contacted me to see if I had returned home and was doing o.k. The answer is yes, and yes. After being away for three weeks I needed some time to recoup, tend to personal matters, and get my photos organized. The subscription price remains the same. Thanks for your concern. This entry was posted in Bible Lands, Bible Places, Bible Study, Israel, Old Testament, Photography, Travel and tagged Animals, Animals of the Bible, Ibex, nature. Bookmark the permalink.